For other uses, see The Wiz (disambiguation). The Wiz: The Super Soul Musical "Wonderful Wizard of Oz" is a musical with music and lyrics by Charlie Smalls (and others) and book by William F. Brown. It is a retelling of L. Frank Baum's classic 1900 children's novel The Wonderful Wizard of Oz in the context of modern African-American culture. It opened on October 21, 1974 at the Morris A. Mechanic Theatre in Baltimore, Maryland and moved to the Majestic Theatre with a new cast on January 5, 1975. 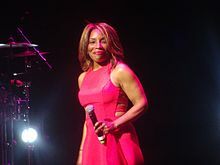 The Super Soul Musical "Wonderful Wizard of Oz"
Stephanie Mills (pictured in 2017) played Dorothy in the original 1975 Broadway musical The Wiz. The 1975 Broadway production won seven Tony Awards, including Best Musical. It was an early example of Broadway's mainstream acceptance of works with an all-black cast. It has had revivals in New York, London, San Diego and the Netherlands, and a limited-run revival was presented by Encores! at New York City Center in June 2009. A big-budget film adaptation of the same name was released in 1978, with Ted Ross and Mabel King reprising their roles. A live television production of the stage version, The Wiz Live!, was broadcast on NBC on December 3, 2015, with an encore presentation on December 19 of the same year. The idea for the musical originated with producer Ken Harper. He replaced the original director, Gilbert Moses, with Geoffrey Holder in Detroit during out-of-town tryouts. The original Baltimore cast included Renee Harris as Dorothy, Charles Valentino as the Scarecrow, Ben Harney as the Tin Man, Ken Prymus as the Cowardly Lion, and Butterfly McQueen as the Queen of the Field Mice. Only Harney would remain in the Broadway cast, but in a much smaller role. Harris stayed on as understudy for the role of Dorothy, as did McQueen for the role of Addaperle. After drawing mixed critical reviews, producer Ken Harper considered closing the musical after its Broadway opening night. One source attributes its turnaround success to a publicity campaign that included a TV commercial featuring the cast singing "Ease On Down the Road," a song that proved so popular that it was released as a single recorded by the disco group Consumer Rapport; The single hit the Billboard Soul Singles chart, peaking at #19 and the Hot 100, peaking at #42. William F. Brown, who wrote the book, gave a more specific explanation in 1993: "20th Century-Fox, the musical's major investor, put in another $100,000 to keep it going and everyone agreed to royalty cuts until the production's cost—about $1.1 million—was recouped....By the eighth week, we were selling out." The Broadway production moved to The Broadway Theatre on May 25, 1977, and closed on January 28, 1979, after four years and 1,672 performances. Along with other musicals including Purlie (1971) and Raisin (1974), The Wiz was a breakthrough for Broadway, a large-scale big-budget musical featuring an all-black cast. It laid the foundation for later African-American hits such as Bubbling Brown Sugar, Dreamgirls and Duke Ellington's Sophisticated Ladies. The musical toured the US in 1976 and during the tour, Kenneth Kamal Scott (then billed as "Kamal") replaced Andre DeShields as the Wiz, Ren Wood was cast as Dorothy but departed the tour after playing only a couple of cities because during the show's engagement at the Ahmanson Theatre in Los Angeles, the 19-year-old performer was recruited for a featured part in the movie production of Hair. Renee C. Harris (who was in her very early 20s) took over as the tour's Dorothy and continued leading that company for a couple of years playing many engagements in cities across the country. At this time, the production also featured Ben Harney as the Tin Man and Ken Prymus as the Lion. Prymus was known to audiences for his featured role in the movie MASH for singing "Suicide is Painless." Both men were subsequently featured in other Broadway shows and were as replacements in the Broadway production of Ain't Misbehavin'. Harney also went on to originate the leading role of Curtis in the Broadway debut of Dreamgirls. When Harris eventually departed the company, the tour continued with Deborah Malone in the role of Dorothy. There was also a second national touring company which was a scaled down production. A revival ran on Broadway at the Lunt-Fontanne Theatre from May 24, 1984, through June 3, 1984, closing after 13 performances and 7 previews. Directed by Geoffrey Holder, the cast featured Stephanie Mills as Dorothy. It then ran in London at the Lyric Hammersmith from December 11, 1984, through February 2, 1985. A planned 2004 Broadway revival was not produced. From 1996–97 there was a US concert version tour with Tasha Scott as Dorothy, Grace Jones (Evillene), Peabo Bryson (The Wiz), and CeCe Peniston as Glinda. The cast also featured Tony Terry as the Tin Man. Romelda Benjamin also played Aunt Em. J.C. Williamson Theatres Limited Australia, Melbourne and Sydney, January–October 1976; starring Andrea Frierson (Dorothy), Victor Willis (Tin Man), Freddie Paris (Lion), Chuck McKinney (The Wiz), Robert Ellis (Scarecrow). Upon his return from Australia in late 1976, Victor Willis joined the cast of the original Broadway production. Flymonkey Productions (London, UK) ran two shows. The first one was in 2000 which received great reviews and a second was run the following year in 2001 receiving exceptional reviews from the London press. Both productions were run at the Hackney Empire. The 2001 show was particularly notable because it was the last show to be performed at the Hackney Empire before the theatre closed its doors for refurbishment. Both shows were directed by Jamie Hinde; musical director Steve White (both shows); production manager Andy Barnes (both shows); choreography by Suzannah Howlett (2000) and Juliet Vibert (2001, also appeared as a dancer in both shows). The production starred Tamsier Joof (both shows); Rustie Lee (both shows); Sharon D. Clarke (2000), Victoria Wilson-James (2001), and Kat of MTV (both shows). A production ran at the La Jolla Playhouse, San Diego, from September 26, 2006, through November 12, 2006, receiving good reviews and extending its run by three weeks. It was directed by Des McAnuff, who, with Harold Wheeler, orchestrator of the original Broadway version, revised the musical for contemporary audiences. It starred Nikki M. James (Dorothy), E. Faye Butler (Evelline) and David Alan Grier (The Wiz), and featured sets by Robert Brill. Dodger Productions holds U.S. rights to revive the musical, while Joop Van den Ende's Stage Entertainment holds the European rights. Stage Entertainment mounted a full-scale production at the Beatrix Theater in Utrecht, Netherlands, in 2006. The production was directed by Glenn Casale and choreographed by Anthony Van Laast and featured sets by David Gallo. City Center's Encores! Summer Stars series production ran June 12 through July 5, 2009. The production was directed by Thomas Kail and choreographed by Andy Blankenbuehler. It starred Ashanti as Dorothy, Tichina Arnold as Evillene, Dawnn Lewis as Addapearl, Joshua Henry as the Tin Man, James Monroe Iglehart as the Lion, Orlando Jones (succeeded by Colman Domingo) as The Wiz, and LaChanze as Aunt Em and Glinda. A major British revival of the musical was produced in 2011 by the Birmingham Repertory Theatre (however performed at the New Alexandra Theatre due to The REP's refurbishment) in a co-production with the West Yorkshire Playhouse, re-locating Kansas to present day Birmingham This production was directed by Josette Bushell-Mingo, with choreography by Paul J. Medford. The first German-speaking production will be produced in Linz/Austria in the new Musiktheater Linz. The production will be directed and choreographed by Kim Duddy. The Fiddlehead Theatre Company, in the historic Strand Theatre in Boston's Dorchester neighborhood, mounted a production, directed by Stacey Stephens, Fiddlehead Theatre Company's Associate Producing Artistic Director, in February 2015. Thirteen-year-old Dorothy Gale lives with her Aunt Em, Uncle Henry, and dog, Toto, on their farm in Kansas. Though her work on the farm keeps her busy, she often gets distracted in her boredom with farm life, choosing instead to play with Toto and dream of someday seeing far-off lands. Aunt Em, however, has little patience for Dorothy's daydreaming, believing that dawdling is contrary to their way of life. After an argument, Aunt Em apologizes to Dorothy for an unintentionally hurtful remark. She explains that she only scolds because she wants Dorothy to be the best she can be, and fears that Dorothy will not be prepared for the responsibilities life will soon put upon her. Aunt Em loves Dorothy dearly and hopes they will always be as close as they were when Dorothy was younger ("The Feeling We Once Had"). When an approaching storm turns out to be a tornado, Dorothy takes shelter in the farmhouse as Aunt Em and Uncle Henry do so in the storm cellar. As the tornado hits the farm, the house, with Dorothy inside, is lifted into the air and carried away for miles, with the wind represented by dancers ("The Tornado"). The house finally comes to rest with a bump in the middle of a field covered with flowers. There Dorothy is met by the Munchkins, all of whom are dressed in blue, and Addaperle, the Good Witch of the North, who tells her that she is in the Land of Oz. Furthermore, her house has fallen on Evamean, the Wicked Witch of the East, and killed her, freeing the Munchkins from her evil powers. Dorothy, distressed and confused, wants only to return home. With her magic unable to take Dorothy beyond the country boundaries, Addaperle decides Dorothy's best chance for assistance is to follow the Yellow Brick Road to the Emerald City in the centre of Oz, to see the great and powerful Wizard of Oz, or "The Wiz" for short ("He's the Wizard"). She gives Dorothy the Witch of the East's silver slippers, and tells her not to take them off before she reaches home, for they hold a mysterious, but very powerful charm that will keep her safe. Dorothy sets off down the Yellow Brick Road, full of doubt and fear at what lies ahead ("Soon As I Get Home"). Stopping to rest by a cornfield, she is startled when a scarecrow hanging on a pole strikes up a conversation with her ("I Was Born on the Day Before Yesterday"). He tells her of his longing for brains so that he can be like other people, and she invites him to accompany her to see if the Wizard can help him. ("Ease On Down the Road #1"). The Yellow Brick Road leads them into a great forest where they discover a man made of tin, rusted solid. They oil his joints ("Slide Some Oil To Me") and he tells them how, to prevent him from marrying a servant girl, the Wicked Witch of the East put a spell on his axe so that it began to cut off parts of his body. Each time it happened, a tinsmith replaced the missing part with one made of tin until he was entirely made of it. The one thing the tinsmith forgot was a heart, and the Tin Man has longed for one ever since. Dorothy and the Scarecrow invite him on their journey to see the Wizard with the hope that he may give him one ("Ease On Down the Road #2"). The trio continue following the Yellow Brick Road deeper into the forest, where they are attacked by a large lion ("I'm a Mean Ole Lion"). However, he is quickly revealed to be a coward hiding behind bravado as Dorothy stands up for her friends. When he learns where they are going, he apologizes and asks if he may accompany them to ask the Wizard for some courage. They agree and the trio becomes a quartet ("Ease On Down the Road #3"), but face a new danger when they are attacked by half-tiger, half-bear creatures called Kalidahs ("Kalidah Battle"). After a great fight and harrowing escape, they stop by the road to rest. The Lion is embarrassed by his cowardice in the battle, but is comforted by Dorothy's kind words ("Be a Lion"). Seeing a green glow in the distance, they continue their journey to the Emerald City, and wander into a field of poppies who blow opium dust on them. Not being made of flesh, the Scarecrow and Tin Man are unaffected, but Dorothy and the Lion begin to become disoriented and drowsy. Dorothy recalls that the Munchkins warned her of the dangerous poppies, and runs from the field as fast as she can with the Scarecrow and Tin Man behind her. The Lion is overcome by the dust and begins to hallucinate ("Lion's Dream"). He is dragged from the field and returned to his friends by the Field Mice who police the area. Marching up to the gates of the Emerald City, they are met by the Gatekeeper who insists they must all be fitted with a pair of green tinted glasses that are locked on to prevent their eyes from being blinded by the dazzling sights. They enter the city and look about in awe at the richly dressed people that inhabit it ("Emerald City Ballet"). The haughty and condescending people laugh and ridicule this odd party for wanting to see the Wizard until they see that Dorothy is wearing the Witch of the East's silver slippers. They are promptly shown right into his palace. Once in the throne room, they are assaulted by a great show of lights, smoke, and pyrotechnics as the Wizard appears in several forms before them ("So You Wanted To See the Wizard"). They each plead their case to him, the Tin Man doing so in song ("What Would I Do If I Could Feel?"). He agrees on one condition: they must kill Evillene, the Wicked Witch of the West. With their goals seeming further out of reach than ever before, Dorothy and her companions sink to the floor in tears. Evillene rules over the yellow land of the west, enslaving its people, the Winkies. She is evil, power hungry, and ruthlessly determined to get her hands on the silver slippers, so that she may increase her power and rule over all of Oz ("Don't Nobody Bring Me No Bad News"). Receiving word of Dorothy and her friends approaching, she sends her Winged Monkeys to kill them ("Funky Monkeys"). Catching up to the group in the forest surrounding Evillene's castle, the monkeys dash the Tin Man against rocks until he falls apart, and rip the straw out of the Scarecrow, leaving both of them helpless. Seeing Dorothy's silver slippers, however, they dare not harm her. Instead, they carry her to Evillene's castle along with the Lion. While searching for a way to get the slippers from Dorothy, Evillene forces her and the Lion to do menial chores around her castle. She takes delight in torturing the Lion before Dorothy, threatening to have him skinned unless she hands over the silver slippers. Angered by this, she picks up a bucket of water and throws it over Evillene, who melts until only her magic golden cap remains. Her spell on the Winkies is lifted, and they show their thanks by restoring the Scarecrow and Tin Man to top condition, and reuniting the group ("Everybody Rejoice"/"Brand New Day"). Returning to the Emerald City, they see the Wizard (now a booming voice that seems to come from the very air). He reneges on his promise, and the Lion knocks over a screen in anger. Behind it stands a bewildered man who claims to be the real Wizard. He shows them the elaborate mechanical effects used to create his illusions, and tells them that he is really a balloonist from Omaha named Herman Smith who traveled to Oz by accident when his hot air balloon drifted off course. The people of Oz had never seen such a sight and proclaimed him Wizard. Not wanting to disappoint them, he assumed the role and had a great city built. He then had everyone in it wear green glasses, and in time, they came to believe it was green. Furious, the group confronts the Wizard on his deceptions ("Who Do You Think You Are? "), but he points out that the Scarecrow, Tin Man, and Lion already have the things they seek as shown in their behavior on the journeys they have made ("Believe In Yourself"). They remain unconvinced, so he creates physical symbols of their desires and they are satisfied. He proposes that Dorothy can return to Kansas the way he came, and offers to pilot her in his hot air balloon. He addresses the citizens of the Emerald City in person for the first time in many years, telling them of his imminent journey, and leaving the Scarecrow in charge ("Y'all Got It!"). Just as his speech reaches its climax, the balloon comes free from its moorings and rises quickly into the air, taking Dorothy's hopes of getting home with it. Just as the group despairs of finding help, Addaperle reappears in a flash of light, suggesting that Dorothy ask Glinda, the Good Witch of the South, for assistance. She transports them to Glinda's castle in the red land of the south, where they are warmly welcomed and invited to rest after their many trials ("A Rested Body Is a Rested Mind"). Glinda is a beautiful and gracious sorceress, surrounded by a court of pretty girls. She tells Dorothy that the silver slippers have always had the power to take her home, but like her friends, she needed to believe in their magic and in herself before it was possible ("If You Believe"). Dorothy bids a tearful goodbye to her friends, and as their faces fade into the darkness, she thinks about what she has gained, lost, and learned throughout her journey through Oz ("Home"). Clicking her heels together three times, she finds herself transported back to Kansas in an instant. As an overjoyed Aunt Em and Toto appear, and Dorothy runs to hug them, she knows that she is back home at last ("Finale"). Main articles: The Wiz (film) and The Wiz Live! Motown Productions acquired the film rights to The Wiz in 1977, and signed Stephanie Mills in anticipation of having her star as Dorothy in the film adaptation. Motown singer and actress Diana Ross asked Motown CEO Berry Gordy to cast her instead, but he declined, feeling that the then-33-year-old Ross was far too old for the part. However, she contacted Rob Cohen of Universal Pictures, who offered to have them finance the film if she were to play Dorothy, at which point he acquiesced. The resulting film version of The Wiz also starred former Motown star Michael Jackson as the Scarecrow, Nipsey Russell as the Tin Man, Richard Pryor as the Wizard, jazz singer Thelma Carpenter as Miss One (the name "Addapearle" was not used for this production) and Lena Horne as Glinda. Ted Ross and Mabel King reprised their roles of the Lion and Evillene from the Broadway production. Sidney Lumet served as director, working with screenwriter Joel Schumacher (who used none of Brown's stage script) and music supervisor Quincy Jones. The film was a critical and commercial failure, performing poorly at the box office and severely panned by critics, who branded the casting of Ross instead of Mills as Dorothy a disastrous blunder. In 1998, following their TV-movie production of Cinderella (1997), producers Craig Zadan and Neil Meron began pre-production on a TV-movie adaptation of The Wiz for The Wonderful World of Disney, which was to star a then-unknown Anika Noni Rose as Dorothy. The project fell through due to Universal still having the film rights to adaptations of The Wiz, and the production was shelved. The O.Z., a hip-hop re-adaptation of The Wonderful Wizard of Oz with an all-Black cast that was to use original music rather than adapt The Wiz, was then planned by FOX and director Chris Stokes in the early 2000s. With Queen Latifah, Patti LaBelle, Busta Rhymes, and Little Richard among its planned cast, the telefilm ultimately went un-produced; FOX instead became a co-producer on The Muppets' Wizard of Oz (2004), starring Ashanti as Dorothy. Eleven years later, following the production of two live musicals for NBC – The Sound of Music Live! (2013) and Peter Pan Live! (2014), Zadan and Meron announced The Wiz Live! as their next production (NBC, by this point, having purchased Universal Studios). NBC's live performance of the stage show aired on December 3, 2015. Stephanie Mills, who originated the role of Dorothy on Broadway, played Aunt Em. An open casting call for the role of Dorothy took place on June 6, 2015. In July 2015, Queen Latifah was cast as the Wiz and Mary J. Blige was confirmed to play the role of Evillene. In addition, Beyoncé was offered to play Glinda, but no deal was made. The following month, David Alan Grier was cast as the Cowardly Lion, and newcomer Shanice Williams was chosen to play Dorothy. Uzo Aduba played Glinda and Amber Riley portrayed Addaperle, the Good Witch of the North. Other principal cast-members included Elijah Kelley as the Scarecrow, Ne-Yo as the Tin Man, and Common as the Bouncer, the gatekeeper of the entrance to Emerald City. All numbers composed by Charlie Smalls save for the following: "Tornado" is composed by Timothy Graphenreed and Harold Wheeler. "Emerald City Ballet (Psst)" is composed by Graphenreed and George Faison. "Everybody Rejoice/A Brand New Day" is composed by Luther Vandross. Scoring for The Wiz calls for two keyboards, bass, guitar, drums, two percussionists, four woodwind players, horn, three trumpets, two trombones, violins, and cello. In his review of the 1984 revival, Frank Rich wrote: "What made The Wiz surprisingly moving the first time around was that its creators found a connection between Baum's Kansas fantasy and the pride of urban black Americans. When Glinda, the good witch, musically instructed Dorothy to 'believe in herself,' she seemed to be delivering a broader inspirational message. The Wiz was hardly a great musical in 1975, but it had something to say, and it said it with verve and integrity. It's depressing to watch a once-fervent expression of black self-respect and talent be spilled on the stage as if it were a trunkload of marked-down, damaged goods." In their review of the 2006 La Jolla production, Variety wrote: "'The Wiz' remains a collage of contemporary slang and imagery, but La Jolla's is a multicultural collage in which Baum's themes speak to the broadest possible audience. Unquestionably, the humor and the heartbeat of the piece remain African-American at their source, but the overall effect is pluralistic and inclusive. In the truest and most positive sense of the phrase, McAnuff's show is color-blind. Every alteration from the 1975 original, inspired by the central multicultural concept, is salutary. Brown's almost wholly rewritten script is tart and funny at last. Smalls' score—supervised by musical director Ron Melrose and original orchestrator Harold Wheeler—sounds fresh and contemporary". The Wiz has been produced around the world; NYC productions include Little Radical Theatrics' production which ran July 19–21, 2015 in Pleasantville, NY. The Original Cast Recording for The Wiz was released in 1975 on the Atlantic label, produced by Jerry Wexler. While well received, the album omits several key songs from the musical that were not recorded for the album. The "Tornado" instrumental was released as both a 7" single and a 12" extended single, while the show's musical arranger Harold Wheeler co-produced a cover of "Ease on Down the Road" with studio group Consumer Rapport that became a charting single in 1975, peaking at #42 on the Billboard Hot 100. In 2017, the original Broadway cast recording of The Wiz was selected for preservation in the National Recording Registry by the Library of Congress as being "culturally, historically, or artistically significant." ^ This was not the same Majestic Theatre that played The Wizard of Oz in 1903, which was on Columbus Circle, where Time Warner Center now stands. ^ a b The Wiz (1975 production) at the Internet Broadway Database. Retrieved 2013-04-21. ^ League, The Broadway. "Victor Willis – Broadway Cast & Staff - IBDB". www.ibdb.com. Archived from the original on 24 September 2015. Retrieved 9 May 2018. ^ Green, Kay, Broadway Musicals, Show by Show (1996), Hal Leonard Corporation, ISBN 0-7935-7750-0, p. 241. ^ a b Whitburn, Joel (2004). Top R&B/Hip-Hop Singles: 1942-2004. Record Research. p. 132. ^ Klein, Alvin (February 7, 1993). "Dorothy and Wiz Hip-Hop Into the 90's". The New York Times. Archived from the original on September 28, 2013. Retrieved 2013-04-21. ^ "The Wiz (1st National Tour, 1976)". BroadwayWorld.com. Archived from the original on 22 October 2012. Retrieved 16 November 2012. ^ "Chronology of London Shows". The Guide to Musical Theatre. Archived from the original on 12 December 2012. Retrieved 16 November 2012. ^ "The Wiz to Get New Broadway Revival in 2004; McAnuff to Direct - Play…". playbill.com. 31 January 2013. Archived from the original on 31 January 2013. Retrieved 9 May 2018. ^ "Des McAnuff Tapped for Dodgers Wiz Revival". Archived from the original on 2009-03-05. Retrieved 7 February 2013. ^ Williamson J.C. Theatres Ltd., official program, May 1, 1976. ^ Portantiere, Michael. "Brady, Burgess, Grier, James, Pettiford, Washington to Star in La Jolla's The Wiz". Theater Mania. Archived from the original on 24 May 2009. Retrieved 16 November 2012. ^ Stevens, Rob. "The Wiz". Theater Mania. Archived from the original on 24 May 2009. Retrieved 16 November 2012. ^ a b Lampert-Gréaux, Ellen. "Wiz Kids". Live Design. Archived from the original on 29 January 2013. Retrieved 16 November 2012. ^ Gans, Andrew. "The Wiz Ends Limited City Center Engagement July 5". Playbill. Archived from the original on 5 January 2013. Retrieved 16 November 2012. ^ "The Wiz at Birmingham Repertory Theatre". Archived from the original on 18 November 2011. Retrieved 16 November 2012. ^ "The Wiz at Musiktheater Linz". Archived from the original on 13 September 2013. Retrieved 5 June 2013. ^ Harding, Chris (2014-10-08). "Along the Nile, Strand-style: 'AIDA' opens Oct. 17 at the theatre; Dot residents get a break". Dorchester Reporter. Archived from the original on 2014-10-15. Retrieved 2014-10-09. ^ Sharp, Kathleen (2003), Mr. and Mrs. Hollywood: Edie and Lew Wasserman and Their Entertainment Empire, Carroll & Graf Publishers, pp. 357–58. ^ Harpole, Charles (2003), History of the American Cinema, Simon and Schuster, pp. 64, 65, 219, 220, 290. ^ a b Schumacher-Rasmussen, Eric (6 July 2000). "Hip-Hop 'Wizard Of Oz' Easing Down The Road". MTV News. Archived from the original on 12 December 2015. Retrieved 30 November 2015. ^ Hibberd, James (July 30, 2015). "NBC wants Beyonce for The Wiz (but there is no deal)". Entertainment Weekly. Archived from the original on August 1, 2015. Retrieved July 30, 2015. ^ Blake, Emily (August 4, 2015). "NBC's 'The Wiz Live!' finds its Cowardly Lion". Entertainment Weekly. Archived from the original on August 7, 2015. Retrieved August 5, 2015. ^ Hibberd, James (August 5, 2015). "NBC reveals newcomer playing Dorothy in The Wiz". Entertainment Weekly. Archived from the original on August 7, 2015. Retrieved August 5, 2015. ^ Roots, Kimberly (August 6, 2015). "Glee's Amber Riley, OITNB's Uzo Aduba Join NBC's The Wiz Live". TV Line. Archived from the original on August 9, 2015. Retrieved August 6, 2015. ^ Kondolojy, Anada (August 13, 2015). "Common, Ne-Yo and Elijah Kelley are Newest Additions to All-Star Cast for 'The Wiz Live!'". TV By the Numbers. Archived from the original on August 15, 2015. Retrieved August 13, 2015. ^ "The Wiz". Samuel French. Samuel French. Archived from the original on 10 June 2013. Retrieved 5 July 2013. ^ Pimentel, Bret. "The Wiz". Woodwind Doubling in Broadway Musicals. Bret Pimentel. Archived from the original on 9 July 2013. Retrieved 5 July 2013. ^ Frank Rich, "Stage: 'The Wiz' Back on Broadway", New York Times, May 25, 1984. ^ Verini, Bob. "The Wiz". Variety. Archived from the original on 29 May 2009. Retrieved 16 November 2012. ^ Builder, Nexus. "Little Radical Theatrics - Home". www.littleradicaltheatrics.com. Archived from the original on 23 March 2018. Retrieved 9 May 2018. ^ "National Recording Registry Picks Are "Over the Rainbow"". Library of Congress. March 29, 2016. Archived from the original on March 29, 2017. Retrieved March 29, 2016. Cast members discuss The Wiz, based on L. Frank Baum's Wizard of Oz an October 20, 1978 episode of WGBH's "Slices of Black Theatre"
The Wiz collection, 1974-1979 Schomburg Center for Research in Black Culture, The New York Public Library. Charlie Smalls scores for The Wiz, 1974 Music Division, The New York Public Library.